**Registration is currently closed! To join the waitlist and to be notified as soon as it reopens, scroll down! Join a community of women that are getting healthier and happier every day! **Registration is currently closed! Enter your email below to join the waitlist and to be notified as soon as it reopens! Just imagine your life as a mom if you were strong, free and happy with your body. ...then the Strong Mommas Coaching Program is for you. Thorough, women-specific workout plans that help you get substantially stronger and leaner. They're quick and effective at boosting your metabolism, building muscles and creating tangible transformation. You'll receive ongoing support and encouragement from a community of Christian women that will be there every day to help you stay on track. Learn how to stop dieting and consistently eat better, so you can finally see and feel results. Meal plans, grocery lists, and accountability charts make it even easier! Whether you're pregnant, postpartum, going through menopause, or have some minor injuries, there are options to help you customize your routine! 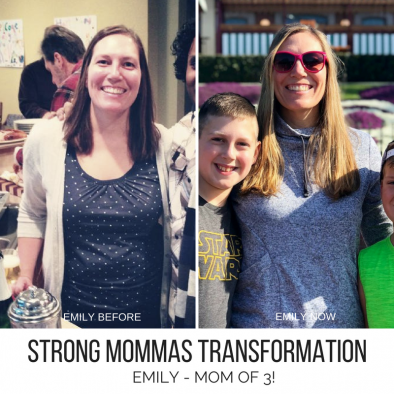 "I’ve tried many fitness programs and Strong Mommas is the first one that helped me be consistent with exercise and completely revamp the way I view and eat food. " As a mom of two boys, I know firsthand the challenges of trying to be a fit mom. 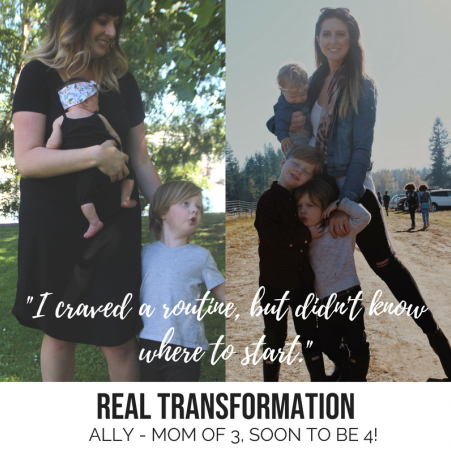 I've been there...trying to squeeze a workout in between naps, finding contentment in my postpartum body, and learning what "strong" means as a mom. All of the workouts I design, and the easy nutrition strategies I teach, have been personally tested in my own life." Megan has a Bachelor's Degree in Exercise Science, is a Certified Strength & Conditioning Specialist, and is a Certified Precision Nutrition Coach. She has over a decade of experience coaching women in person and online with outstanding results. Choose either the beginner or intermediate/advanced workout plan. Each workout has a video demonstrating the exercises so you know exactly what to do. The workouts are quick, simple, and can be done at home without any fancy equipment. You'll even get specific help if you're pregnant, postpartum, or dealing with nagging injuries. Learn a simple way to choose healthy food every time. The downloadable guide teaches you everything you need to know, plus how to eat right for your body type, when & how often to splurge, workout nutrition, and more! The meal plans, healthy recipes and accountability charts make it so easy! You'll have immediate access to a sisterhood of like-minded women in a private Facebook group that will build you up, spur you on, and even pray for you through tough times. You'll have the opportunity to do two 15-minute private coaching calls with Megan for FREE, one at 6 weeks into the program and the other at 12 weeks. Use these calls to help you customize your program, troubleshoot barriers, and gain clarity with your action steps. With weekly motivational emails, weekly LIVE Q&A sessions, and LIVE workouts with Megan, you'll have the continual interaction and support you need to succeed. "I absolutely love the heart of Strong Mommas. It's helping women realize their worth and helping them tangibly take care of themselves. The community is excellent but, I really love that it is a ministry through Jesus and that it works!" "I love that we get new workouts every month and that you can do them in the convenience of your own home! The nutrition info is so helpful and really helps me eat healthier throughout the week. I also love the culture of this group and how it's centered around long-term change and becoming strong, rather than focusing on what you look like. You get all of this for such a reasonable price AND part of your membership goes to helping those in need. So much to love!" "Strong Mommas is affordable, encouraging, and not complicated at all. Megan never makes you feel bad about where you are or what your current or past choices were." "This has been the only fitness and/or nutrition program I have ever stuck with for longer than three months. It is easy to do everything required to see results while being in the busiest, most chaotic phase of life (mom to 3 young kids). It’s changed me inwardly, too, with my perspective on food and truth from the Bible related to these topics." You won't find another program that meets all the needs of a mom...physically, emotionally and spiritually. It simply doesn't exist anywhere else. Find out what it feels like to be strong, pain-free, energetic, and confident in your own body. Experience a grace-filled program, where we rejoice over real heart & mind changes as much, if not more than, pounds lost. Whether you're a true beginner or an experienced athlete, you will be appropriately challenged. In fact, you don't even need to be a mom to join this fantastic community! Strong Mommas is not affiliated with any other product or program. No upsells or expensive supplements. Guaranteed. Strong Mommas donates half of every monthly coaching fee to First Image and Northwest Children's Outreach, two organizations that are directly servings moms and babies in need. "This program has completely solved my problem of decision fatigue - always trying to figure out what to do! I just love that it's all-inclusive and I don't have to guess anymore." and don't even include nutrition coaching or an accountability group! top-notch training plan, nutrition coaching, and accountability! Are you ready to join a community of women that are getting healthier and happier every day? Did you know? 50% of every Strong Mommas Membership fee is donated to mommas and babies in need. Strong Mommas partners with both First Image and Northwest Children's Outreach to help financially support the most vulnerable in the community. You get to help by joining! START $1 TRIAL MONTH NOW!